I am in feather heaven. HEAVEN! 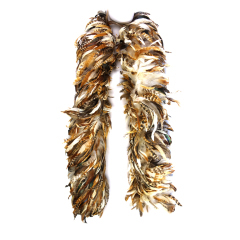 I was surfing through firstdibs.com and found all these feathered pieces that are just to die for. Green, red, black, orange… you want it, they got it. I thought I might post here some of the pieces I especially loved, but feel free to surf for yourself and post your favorites in the comments. I’d love to hear what appeals to you most. One of the most original pieces I found is a lime green knit cut, and hemmed with gorgeous ostrich feathers. Is it not beautiful? This bubblegum pink hat (by Christian Dior might I mention?) features matching feathers on the side. If the feathers were a different shade the overall effect might have been a bit overwhelming, but bold uniform color makes the piece a killer. What would you pay to put this masterpiece on your head? Night out on the town with your girls, and nothing to spice your wardrobe up? 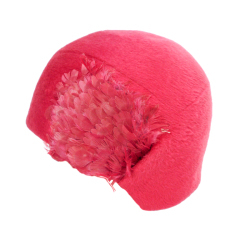 Why not try this enthralling feather boa – with safari themed colors and a thick fluffy finish? There’s no way you could go wrong. You’ll never want to take it off! Have you splurged on some designer feathered accessories or dresses lately? Are you also going on web-feather-searching-binges? What are your favorite sites? Let us know! feather hair extensions is the most popular trend of year.